“Piecework” editor, Linda Ligon, issued a challenge to figure out two patterns from Weldon’s Practical Needlework. 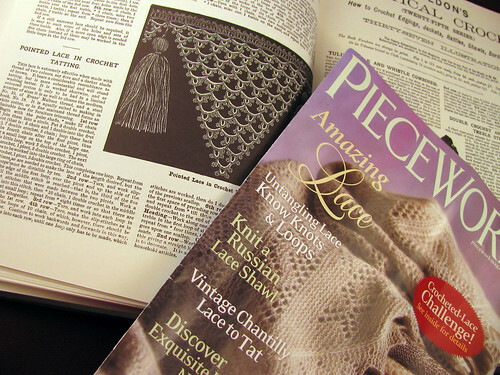 This month’s issue of the magazine is about lace. I love lace, especially crochet lace. Well, the article on crochet lace is a challenge because even though Ms. Ligon can crochet she could not understand the Weldon’s directions. I read the directions and they were really clear. It would be no problem for me to make a sample. The only problem is I am in the middle of learning to knit socks, make a yo-yo purse, learning the dSLR camera and of course finishing up 15 UFO’s. I am tempted by the challenge. The other pattern is an easy one too, except for the size and the number of stitches. It is tedious rather than difficult. The magazine is looking for an ongoing crochet consultant. It is an interesting proposition. Then again, since I could understand the patterns I am sure lots of other lace crocheters can too. This entry was posted on Tuesday, April 28th, 2009 at 3:00 am and is filed under Crochet. Tagged: Crochet. You can feed this entry. You can leave a response, or trackback from your own site. You would be perfect as a consultant! I say GO FOR IT! I agree–go for it! What I love about Piecework is the stories and the history attached to the handwork. I can’t imagine that there’s any other lace crocheter who has the historical knowledge of lace that you have. You’d be perfect!